Roger Stone, a longtime adviser to President Donald Trump, has repeatedly lied or contradicted himself on numerous issues related to special counsel Robert Mueller’s Russia investigation. Stone is a vicious racist, misogynist, liar, and conspiracy theorist who describes himself as “a 40-year friend and advisor of Donald Trump.” He worked as a paid consultant to Trump’s campaign for part of 2015 and has since advised him in an unofficial capacity. He was banned from CNN, MSNBC, and even Fox News in 2016 because of his vitriolic rhetoric. However, allthree networks have since welcomed him back as a guest. Stone also writes commentaries online and works for conspiracy theorist Alex Jones’ Infowars network. Nothing Stone says should be taken at face value. 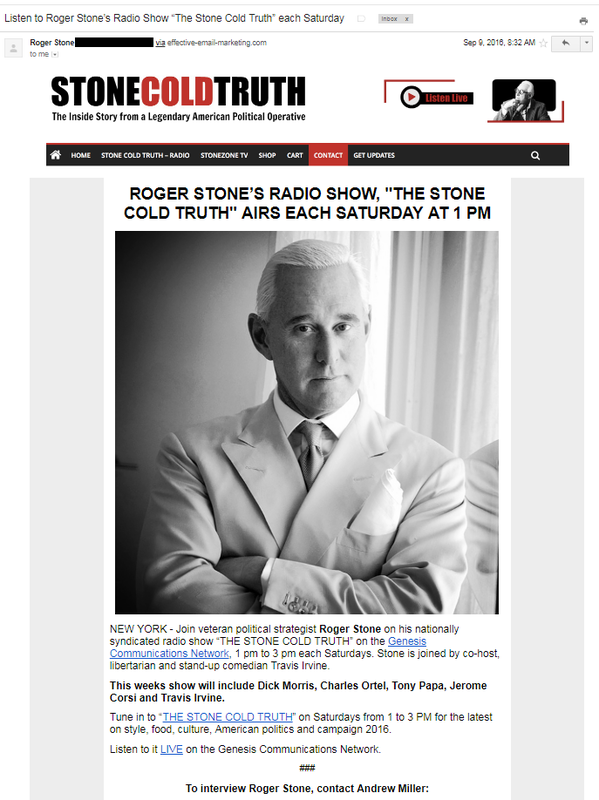 Even staunch right-wingers don’t trust Stone, calling him “a sleazeball” (Fox News host Mark Levin); “a little rat” (pro-Trump super PAC head Ed Rollins); and “one of the worst people in the world” (radio host Glenn Beck). Stone’s career as a dirty trickster has come back to haunt him in the form of Mueller’s investigation. Sources told CNBC that Stone “is apparently one of the top subjects of the Mueller investigation into potential collusion between the Kremlin and the Trump campaign.” ABC News recently reported that “at least seven people associated with” Stone have been contacted by “Mueller, according to interviews with witnesses and others who say they’ve been contacted.” Stone was also likely one of the unnamed people whose activities were mentioned in Mueller’s July 13 indictment of 12 Russian intelligence officers for election interference. Stone claimed that he “never communicated with WikiLeaks,” but messages show he directly communicated with the organization. Stone claimed this month that he wasn’t in “regular contact” with the Trump campaign in 2016, but he had previously bragged about his 2016 discussions with the campaign. Stone claimed that a subpoenaed associate “has not worked for” him “for three years,” but that associate worked for Stone at least in 2016 and 2017. Stone started a legal defense fund for himself but “has contradicted himself on what he’s paying for and how much he’s projected to pay” in legal costs. Stone had contacts with Russians during the 2016 campaign. As Stone acknowledged, he met with “Henry Greenberg,” a Russian national who claimed to have damaging information about Democratic presidential candidate Hillary Clinton, in May 2016. 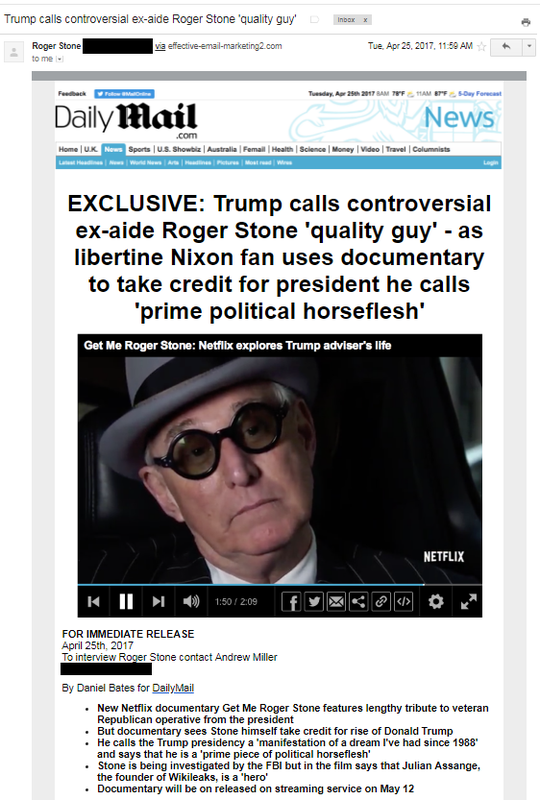 Stone also communicated online with Guccifer 2.0, “the digital persona alleged to have been set up by Russian military intelligence,” as The New York Times wrote. Stone told ABC News that he only publicly disclosed the meeting with Greenberg last month because he “just didn’t remember. 2016 was a pretty busy year.” He also claimed that the Greenberg meeting was “a failed Obama FBI sting operation” and has denied that Guccifer 2.0 is Russian. On March 17, 2017, WikiLeaks tweeted that it had never communicated with Roger Stone, a longtime confidante and informal adviser to President Donald Trump. In his interview with the House Intelligence Committee last September, Stone, who testified under oath, told lawmakers that he had communicated with WikiLeaks via an “intermediary,” whom he identified only as a “journalist.” He declined to reveal that person’s identity to the committee, he told reporters later. Stone has claimed, both before and after The Atlantic piece was published, that he “never” communicated with WikiLeaks. Stone told CNN by phone, “I don’t think it is me because I wasn’t in regular contact with members of the Trump campaign,” although he was in contact with Donald Trump himself. Regardless of whether he’s mentioned in the indictment, Stone is contradicting himself about his contact with the Trump campaign in 2016. For instance, on a July 10, 2016, appearance on a radio program, Stone said: “I spoke yesterday to Donald Trump’s campaign manager, Paul Manafort, an incredibly able fellow, an old friend of mine, former business partner of mine, in fact.” He appeared on a radio program on August 17, 2016, and said he “spoke to” Manafort about the hiring of former Breitbart.com head Steve Bannon. Stone also said he communicated with Trump campaign communications official Michael Caputo during the campaign, who helped arrange a meeting with Russian national “Henry Greenberg” in 2016. Stone’s response is a lie. Stone’s political organization, Committee To Restore America’s Greatness, paid $9,000 to Miller’s research firm over three months (May, June, and August) in 2016 for “expense reimbursement” and “consulting,” according to Federal Election Commission records. Another Stone group, Stop The Steal, also paid Miller’s firm $5,000 in “consulting fees” on October 13, 2016 — months after the July Republican National Convention — according to IRS records. In recent months, Stone has been attempting to raise money for his “legal defense fund.” But CNBC reportedon May 2 that “Stone has contradicted himself on what he’s paying for and how much he’s projected to pay” in legal costs.